The Westin Chosun Busan succeeded in becoming the exclusive outside catering business for the Nurimaru APEC House. This famous venue was used as the APEC 2005 main conference room where the world leaders gathered for the Economic Leader's Meeting and the 19th South & North Korea Summit Talks. Other top luxury hotels in the Busan area had also entered in this highly competitive bidding to receive this prestigious privilege. In a showdown of this fierce battle, The Westin Chosun Busan rose above the rest and is now the only hotel to be the sole outside caterer for all food & beverage services. 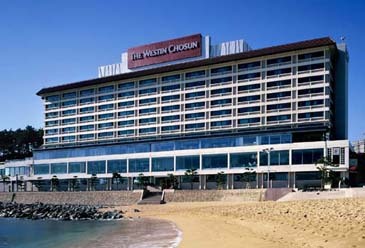 From the very beginning of the bidding, The Westin Chosun Busan had the upper hand with the strongest location and unrivaled service know-how. During the APEC 2005 and the 19th South & North Summit Talks, The Westin Chosun Busan had developed exceptional menus to satisfy the sophisticated tastes of global leaders, and will continue to do so with the same passion, dedication and creativity in the future.